celebrating indie artists: Free tickets to see Giana Nguyen! Free tickets to see Giana Nguyen! 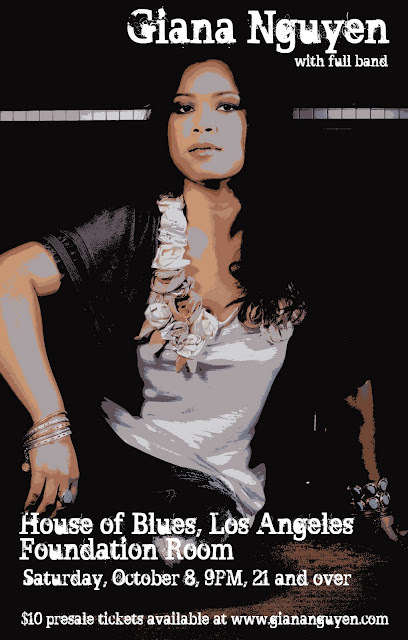 The prize is a pair of complimentary ticketsfor her upcoming show at the House of Blues - Los Angeles (Foundation Room) on Saturday, October 8th at 9pm. Winner must be in the greater Los Angeles area (obviously). Winner's name and e-mail address will be on the VIP list for tickets at will-call. The usual Fine Print applies. To enter, just comment on this post by 4:00PM Central time on Friday, October 7, 2011 with your e-mail address. Feel free to use funky characters to obscure the address from search engines. I will need the winner to get back to me quickly when I e-mail them so that I can get your name to Giana for the VIP list! This is a quick one. Good luck!